Lively scarlet Gerbera amidst sprays of crisp white Chrysanthemums form this wondrously piquant bouquet that will raise the spirits of anyone who receives it.Vase not included however, we recommend a Standard Vase to complement Eolande and leave a lasting impression. Easy, accurate, delivered on time. Happy customer & recipient. 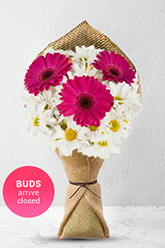 Great ease with ordering the flowers which mum recieved & loved them in time for mothers day. Very prompt. Would love to get a picture of flowers sent though. Lovely flowers and my friend loved them!